Nottinghamshire Police are appealing for information after two burglaries in just over a week. Shocking CCTV footage showing a group of men armed with machetes attempting to break into a house in Nottinghamshire has been released by police. The footage shows five armed men accessing the property through the gate. It has been released by officers investigating two burglaries on Chilwell Road in Beeston. The incidents occurred on October 20 and 28. In the video, the men can be seen peering over the perimeter of the property, before making their way through the gate. Some of them even look up at the camera. 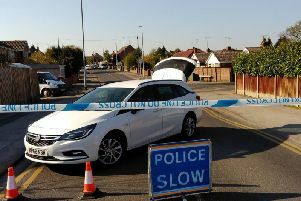 Anyone with any information should call Nottinghamshire Police on 101, quoting incident number 857 of 28 October 2018, or Crimestoppers anonymously on 0800 555 111.